Website: http://www.neveralonegame.com Players: Single or local, 2-player cooperative. Ages: 6+. Platforms: Xbox One, Playstation 4, Steam. Completion Time: 3-6 hours. 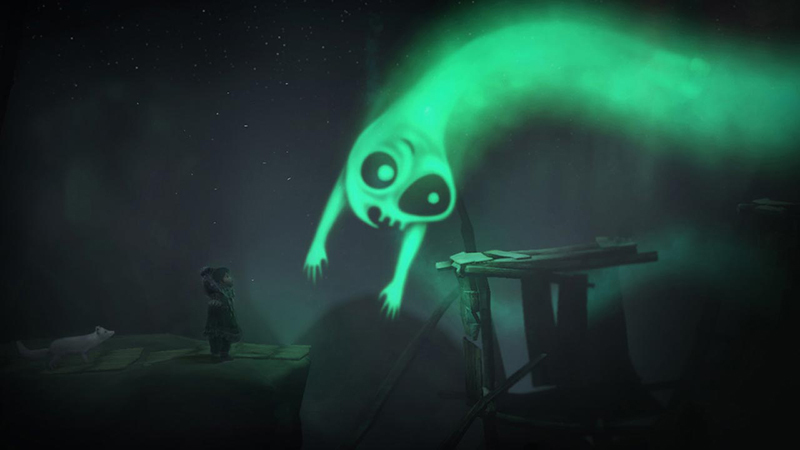 Never Alone (Kisima Ingitchuna), an atmospheric platformer and puzzle game (built on the Unity engine) released in late 2014 by Upper One Games and education company E-Line Media, invites one or two players to explore a central story from the Iñupiat, Native Alaskans, with the rewards of additional storytelling by elders and community members. This game marks the first time the Iñupiat have collaborated with game-developers to bring their stories to life, and it is these stories that make the game so special. Further research was done by anthropologist Aaron Crowell and ethnomusicologist Aron Fox. It's exciting to know that this is the first of Upper One Games' series of 'World Games' that, as their website explains, will 'draw fully upon the richness of unique cultures to create complex and fascinating game worlds for a global audience'. Judith Winters, editor of Internet Archaeology, asked me to review the game from an archaeological perspective, studying how it connects to prevailing material culture while building a story via the range and formats of play. What is the broader relevance of the game for archaeologists? Can games like this be used as educational tools, and can they communicate the ideas of preservation and of archaeological research? 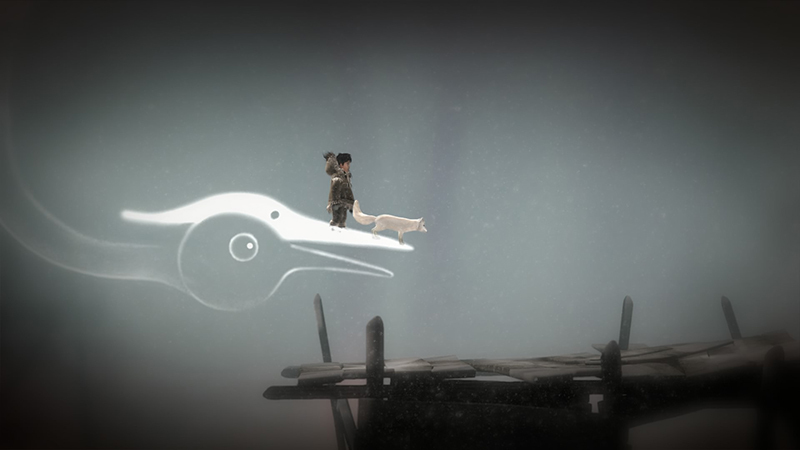 In Never Alone, you play an Iñupiat girl, Nuna, and her pet arctic fox (Figure 1). If you play cooperatively, you'll fight with your friend over who gets to play what. Both the girl and the fox are button-cute and full of warmth, and the love and bond between human and animal is genuine and apparent without becoming saccharine. 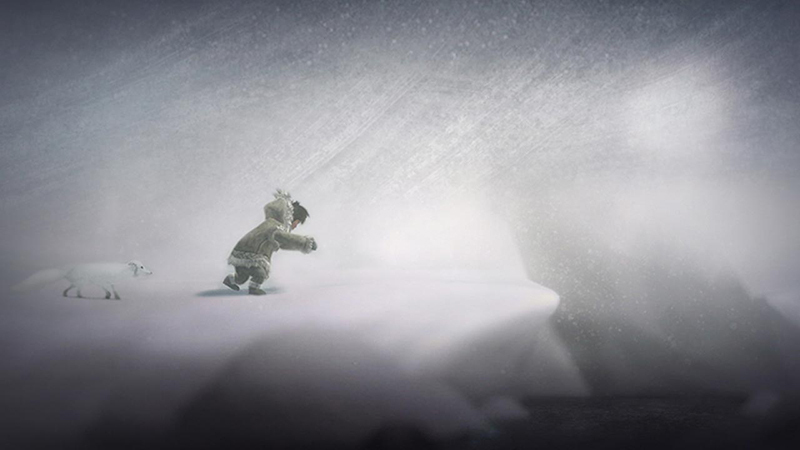 The central Iñupiat story focuses on the girl's adventure in finding the source of a relentless blizzard threatening her village. As she wanders east, she meets her fox companion, and then bravely encounters creatures, spirits, and demigods straight out of Iñupiat folklore. There are already dozens of reviews in dedicated gaming publications in print and online that describe Never Alone's side-scrolling style. Stripped of its one-of-a-kind story, the game is one long jumping-puzzle. Nuna and the fox must work together to climb ice cliffs, escape polar bears (and worse), and ultimately confront the snowstorm's creator. Personally, I have never been a fan of these kinds of games, where you know what to do but just don't press the proper buttons on the controller at exactly the right time to make a successful leap to safety instead of getting ground to bits by crashing ice floes. But even if platform-jumpers aren't your thing, you really should spend the 3 to 6 hours just to experience the story and to be awed completely by Iñupiat art and storytelling, drumming, and some of the best sound design I have ever heard. The rewards certainly compensate for any frustration you experience, and the controls have been improved and made more forgiving in a recent patch. Playing as an archaeologist, I was immediately drawn to the permafrost architecture of sod houses framed with whalebone, drying racks of driftwood upon which hung fish or meat, and waving banners allowing those out in the snow to find their way to a hospitable place. I searched for images after playing and found the game's design to be true-to-life. As soon as you begin playing, you encounter owls who hoot at you to remind you to access a newly unlocked video. These short, documentary films – 24 in total – mix interviews with Iñupiat elders and storytellers with archival footage of Iñupiat life in the north-west of Alaska (Figure 2). In the first video, storyteller Ishmael Hope says outright that 'we are not a museum piece. We are a living people and a living culture'. 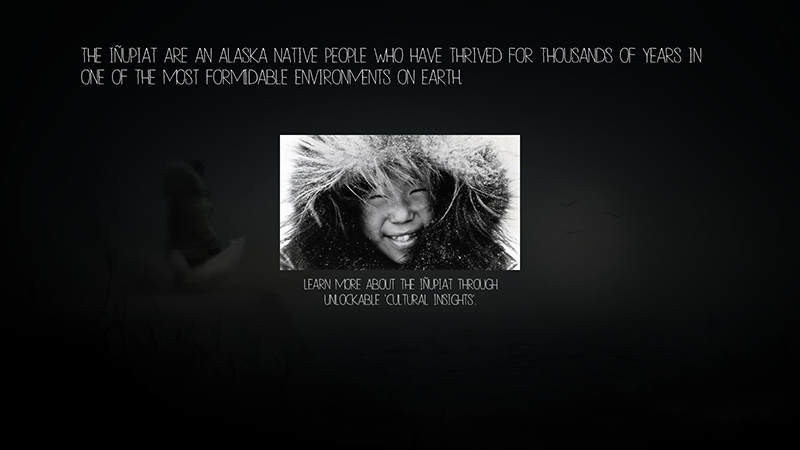 Hope introduces the Iñupiat concept of interconnectedness between humans and the natural world, and the great importance of sharing, spirituality, and traditions. Through Hope's narrative you learn that you are never alone. In fact, it is impossible to 'beat' the game as just Nuna or as her fox. The pair must work together, and Nuna learns more from her animal companion than he does from her (and yes, the fox is a 'he' as is revealed later in the story). Interspersed between playing in the snow and watching these videos are cartoon cut-scenes that, in their style, immediately reminded me of the story of the Deathly Hallows in the penultimate Harry Potter film (Figure 3). On watching these back a second time, I realised that these cartoons are actually informed by Iñupiat scrimshaw, which told stories in black-and-white, frame-by-frame. There is a video that you can unlock that describes the importance and use of scrimshaw in Iñupiat culture. As you explore the wilderness, you are struck by the barren, rolling landscape occasionally dotted with rock cairns, the lack of vegetation (excepting occasional scrub), and the constant wind, the effects of which begin to wear on you psychologically as you play (Figure 4). In fact, when I played the game through a second time, I understood that the wind was respirating, and that it, like the land and the animals on it, was a living thing. There are occasionally trees, and you explore King Island – modelled on the real island by the same name – stacked high with houses on stilts, and rickety bridges and walls of wood held together by sinew. You feel cold, but you never feel alone, surrounded by helpful spirits, your fox, and also the dangerous polar bears, the 'Man Slayer', the 'Little People', and others, characters from Iñupiat myth drawn and animated in consultation with the Tribal Council to get the details right. Nuna wears head-to-toe caribou furs, boots, and leathers in the traditional style for girls (I checked online after playing to see pictures of Iñupiat in identical dress), and later learned from a reward-video about the primacy and superiority of caribou for warm, weatherproof clothing. As she explores wearing her caribou parka, she encounters a village and the perils of fire. The Man Slayer is there, giant and grotesque, the only character sporting facial hair and studs in his lower lip. 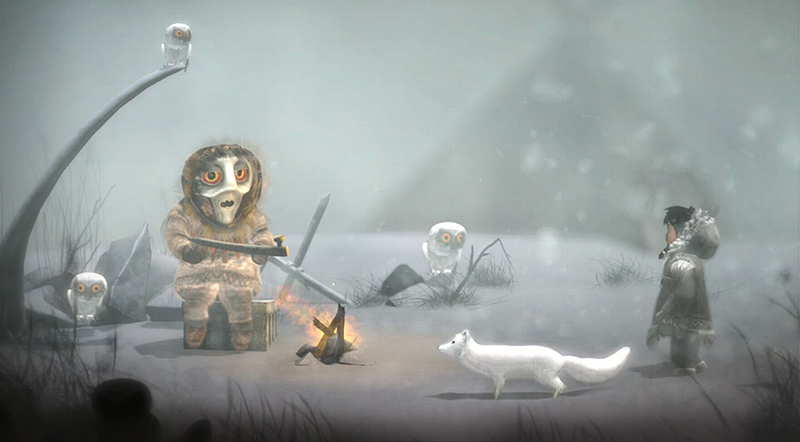 As you play Never Alone you do encounter three artefacts: the drum, the bola, and the adze, and all three are used as currency for barter within the game. 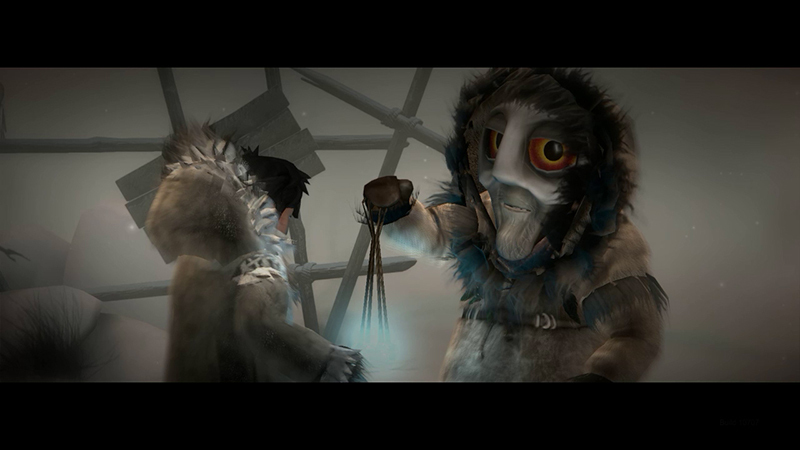 Nuna is tasked by one spirit to retrieve his drum, and in doing so, she is rewarded with an ice-shattering bola (Figure 5). 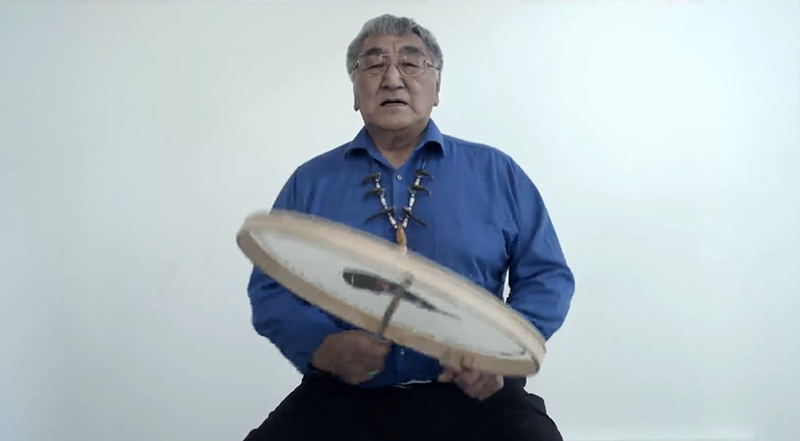 We learn about the importance of drums and drumming, and listen as James Nageak plays and sings, breaking the drumhead in his enthusiasm (Figure 6). We learn about the bola and its use as a silent, duck-hunting tool. And we learn about greed for material things when the Terrible Man pursues Nuna and the fox because he wants the bola at all costs. The adze features late in the story, a tool used to cut ice. The shape and function of these three artefacts reflects 1:1 how they appear in current (and past) Iñupiat culture as the story blends seamlessly into 'real' life. Aetiological myths abound, and perhaps the most engaging one explains the composition of the Northern Lights (Figure 7). Even the weather is personified and alive. Almost everything seems to be amoral and predisposed either to keeping or restoring balance in nature. We learn at last the name of the story we have been playing: Kunuuksaayuka. He is the ice-man, the physical representation of the adze, and his purpose is to remind you that even though you are human, you are not the biggest thing in the world. The game teaches you humility. Never Alone is a masterpiece in storytelling, and in communicating folklore and culture past and present. Although the attention to detail in the construction of buildings and to the art of the Iñupiat are of the highest quality, and the documentaries completely captivating, the best and possibly most subtle feature of the game is the narrated story itself. Robert Nasruk Cleveland tells the tale of Kunuuksaayuka in the Iñupiat language, preserving that within the context of the game, too. 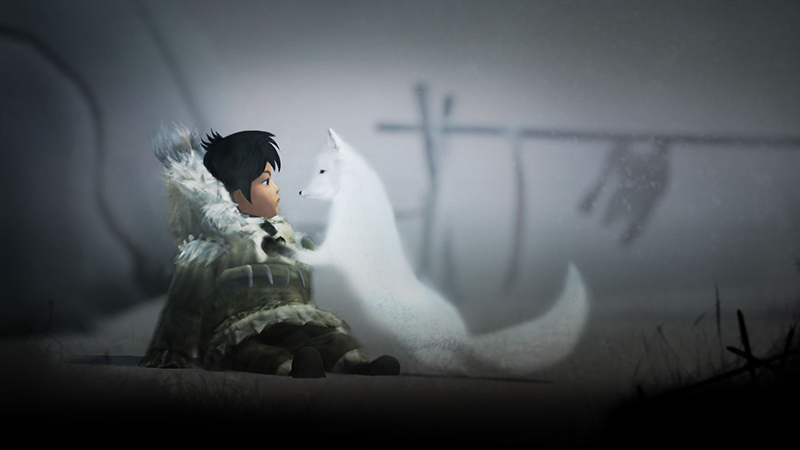 Never Alone works best as a single, playable story. It successfully blends harsh weather and bleak landscapes with the warmth of villages and the extended family of people, animals, and spirits (Figure 8). 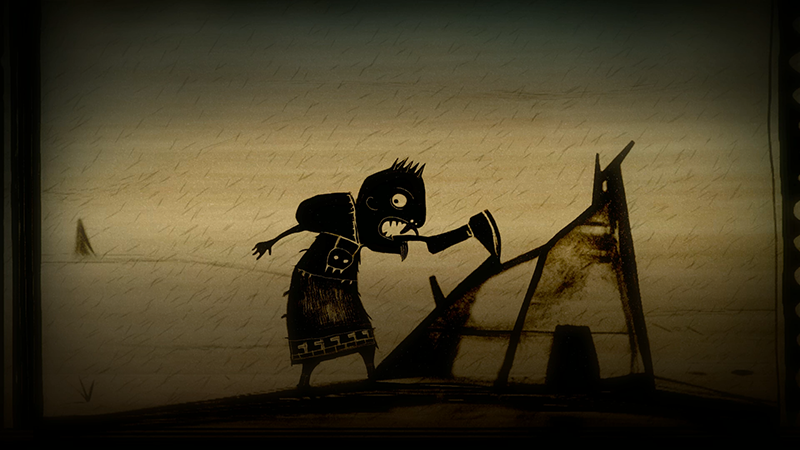 The game's design is informed in great detail by Iñupiat art and architecture without taking much in the way of creative licence or liberty. Storytelling and the necessity for people to work with – not against – nature resonates deeply in the heart of this game, and it succeeds not only as an anthropologic document, but also as a teaching tool. The game punches above its weight, too, going beyond the stories and oral histories to tackle issues such as climate change. The Iñupiat have lived in Alaska for centuries and know the weather, wildlife, and ice, and there is a warning here, and sadness and frustration. The material culture within the game – the dwellings, racks, cages, clothing, drum, bola, adze, and even a scrimshaw pipe (Figure 9) – add depth to the story while also serving both to help and hinder the player. Understanding their uses helps one play the game, and also goes a long way towards world-building and blending the archaeology of 'stuff' with that of the landscape. The broader relevance of the game for archaeologists is that it preserves a snapshot of a living culture and history with vibrant lore fully based in reality while incorporating elements of the past within it. Playing this game makes one occupy both past and present at once, perhaps getting at the nature of time as perceived by the Iñupiat. We learn form and function. We also learn science and art. It is the archaeology of the recent past, but little has changed in Iñupiat life over the last 50 years or more. The game helps to preserve that history while teaching lessons of conservation and preservation as a means to perpetuate culture. The game is a gateway into serious research on the Iñupiat, and one gets the sense that the invitation is there to visit, listen, and learn.